An ordinary man undergoes extraordinary duress that has the potential to break him or change him forever. This is the basic premise of “Cold in July,” a bloody Southern-fried thriller that is undeniably slick in execution yet nevertheless manages to maintain a higher level of realism than many films of it’s ilk. 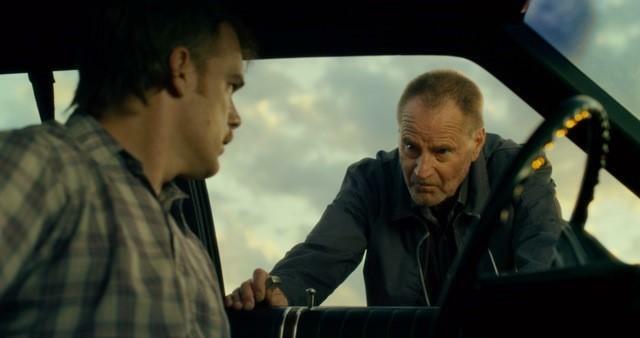 But “Cold in July” still managed to surprise me, going in a direction I had never expected and growing twistier by the minute. Richard Dane (Michael C. Hall, Dexter) is an average schmoe who kills a home invader accidentally-ish and must protect his wife (Vinessa Shaw) and son (Brogan Hall) when a man who appears to be the intruder’s father (Sam Shepard) threatens their lives. But just when you think the grizzled old goon’s going to be the lead antagonist and pull the conflict toward a predictable conclusion- Bam!- the plot swerves another direction entirely. It’s surprising and actually really cool to see Ben (Shepard,) Richard (Hall) and a slick-as-ice good ol’ boy named Jim Bob (who ‘knows a guy who knows a guy,’ to quote Breaking Bad‘s Saul,) played by Don Johnson, join forces to fight a greater evil. The effect of this movie is not dissimilar is digging into a happy meal to find a prize that totally isn’t what you expected, but hey, looks pretty good on your bureau after all. The color scheme is wild and crazy, and above all, striking– most scenes are shot with a filter that seem to cloak the environment either in orange and yellow or an intense cyan color. This is a daring move on the cinematographer’s part, although sometimes it doesn’t quite work- the colors are at times so turned-up that it’s hard to focus on anything else. The Electronica-heavy soundtrack might turn off some potential viewers and drive others to agitation, but it was just fine by me. Another radically unique way they set up the movie is the atypical portrayal of action hero Richard. Unlike most of these kinds of movies, it doesn’t seem that Richard enjoys killing, although he feels compelled to do it later on in the film. The killing of the burglar is messy and violent, but neither Richard nor the filmmaker seem to particularly take glee in it. After the event, Richard seems visibly shaken, which is a powerful anecdote to all those testosterone fueled protagonists who take pride in their first kills. When Richard kills again, it is a out of a sense of duty to his companions, but he still doesn’t seem to get any enjoyment out of it. He’s not the quipping, sneering hero of 80’s action movies. He is you. He is me. He doesn’t really know how to handle a gun, but he wields one anyway because it is what is expected of a Southern father and husband. Whether it serves him well is ultimately up to you to decide. 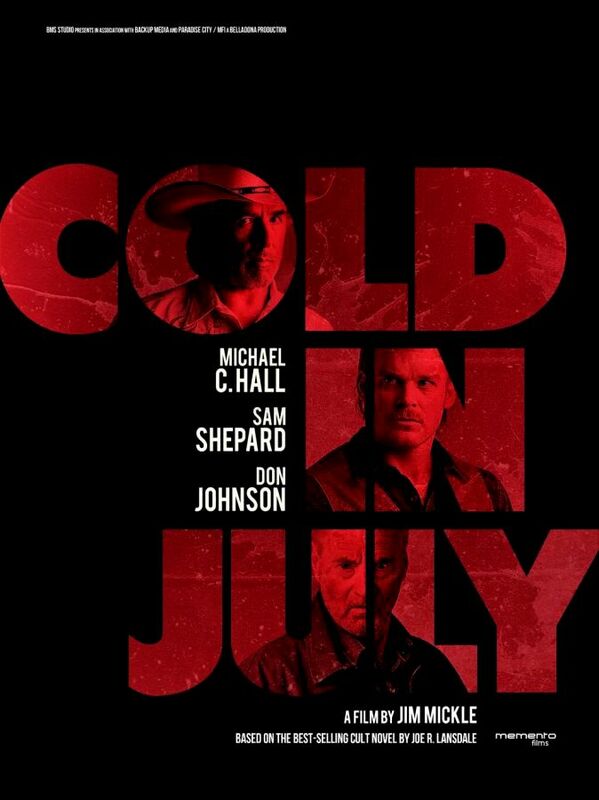 There are unrealistic moments in “Cold in July” (like Richard dodging machine gun shells towards the end of the film, I mean come on!,) but if you’re looking for something quite different from your average, run-of-the-mill action flick, I suggest you give this solid little thriller a try. Warning– As the stream of violence is continual and gruesome (and because of a scene of violence against women,) weak stomachs may want to steer clear of this gory, gutsy revenge flick. “Frasier”‘s David Hyde Piece turns up the camp for “The Perfect Host,” a perfectly functional black comedy that deteriorates into an incomprehesible mess. Sporting more twists than Snakes and Ladders and more holes than a putt-putt golf course, the end ruins what is otherwise an enjoyable exercise in kitsch. John (Clayne Crawford) is on the run after a bank robbery gone wrong- and camps out in the wrong house when he enters the L.A. home of Warwick Wilson (David Hyde Pierce,) a well-mannered gentleman with a sadist’s streak. Warwick, a full-blown Schizophrenic with a plethora of imaginary friends, holds John captive, while flashback reveal what led up to John’s crimes. Sounds great, doesn’t it? It kinda is… until “The Perfect Host” falls prey to ‘the curse of the thriller’ and piles one nonsensical plot twist after another. I was reminded of the eye-roll ending of Stephen Soderburgh’s “Side Effects,” which brick by brick tore down the foundation the film had strove for. Still, there are some great things here. 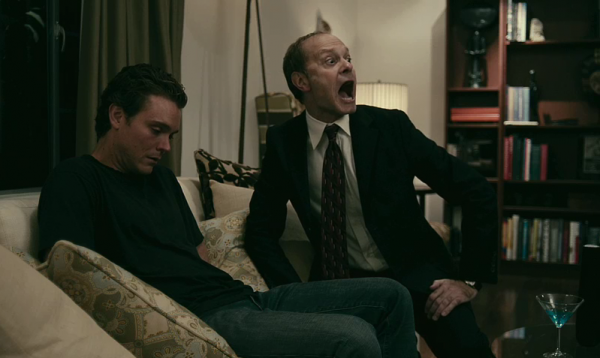 The moments in David Hyde Pierce’s delightfully over-the-top performance where you can practically see him smiling over the script. The scene with Warwick f’ing his imaginary friend in the bathroom. It’s all very fun and funny, until the filmmaker overplays his hand and transforms a fun ride into an unmitigated disaster. The obviously gay David Hyde Pierce plays the (presumably) straight Warwick here, which works about as well as it does in “Frasier” (which is to say, not at all.) The musical score is more than a little overbearing, but like Warwick, we are willing to play along… for a while. 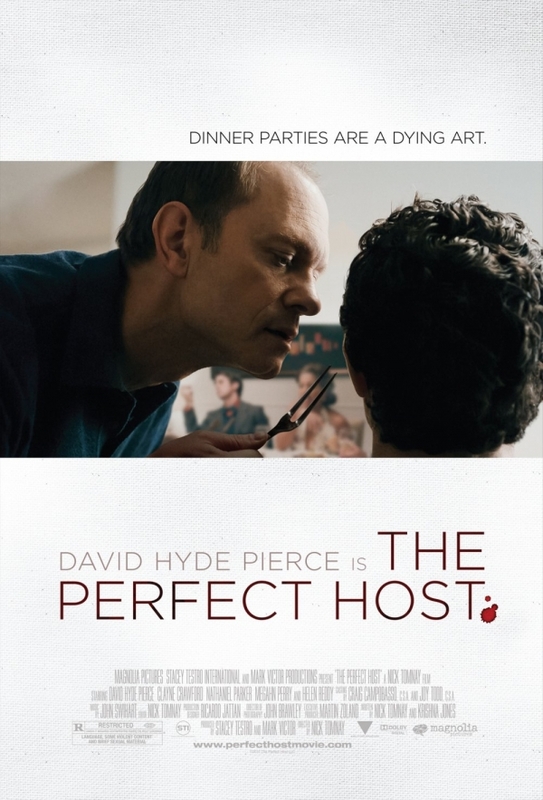 “The Perfect Host” is a good example of a typical first feature- good in parts, not so good in others, and puzzling as a whole. If it had quit when it was ahead and ended by the 1 hour 10 minute mark, this may have been a different review altogether. As it is, it concludes as a mess, albeit an interesting one. Pity. Pierce deserves a better vehicle than this, and director Nick Tomnay refuses to give him one. Horror filmmaking, a visualization of things no one wants to happen to them, can be morbidly fascinating, or even lyrical. Tomas Alfredson’s Let the Right One In, particularly, told its story brilliantly and in some ways transcended the vampire genre. Them, a slight trip into depravity advertised as “the movie that terrified the French,” is not. It is tripe. The film doesn’t stand as much as a worthy story with characters as a gaudy set-designed ego trip, with meticulously designed dark corners, piercing screams, and convenient pitfalls. When the heroine, schoolteacher Clementine, chose a place in the attic of her sprawling isolated home to escape from the home invaders of the film, of course it is an otherwise empty section with cellophane hanging in clumps from the ceiling, each one vaguely looking like a cloaked face. Of course Clementine and her boyfriend Lucas live in an isolated manor. And finally ,of course the isolation is broken by a “annoying” dog, who barks to warn them too late. After the inevitable death, the film focuses on Lucas, a writer who does his best work playing arcade games, and Clementine, a frustrated primary school teacher. For a period of about fifteen minutes, the two exchange a stream of smooth and natural dialogue, in such a way I mistakenly started hoping that I would care what happened to them. After that, the script runs out of such dialogue, and settles on standard horror talk. I started laughing out loud at the banality of it, a bad sign with a film that wants to be taken this seriously. The acting in the film is decent, the performers pounding on the one note the director brings to the table, mostly comprised of frightened shrieks and tear stained faces. The plot is a series of grotesque occurrences, putting the characters through horror and trauma. It’s plotlessness is “compensated” for with a couple of jumps (it barely succeeds). The slashers are barely frightening and completely nonsensical. Simply put, it is a series of close escapes and killings, too premeditated and shallow to provoke much reaction. I learned something, though. Nothing about safety, nothing about human nature. I learned that a film’s cool cover art, cinematic pedigree (foreign), and being spoken in a pretty language (French), does not make it very much superior to American money mongerers. Nor does it classify it as high film-making. That is all.